Dietitian and Nutritionist Rebecca Gawthorne (you may know her as the brains behind Nourish Naturally) is seriously inspiring - and lovely - human. Bec is one smart cookie. She inspires more than 140,000 people to be healthier on her Instagram with her undeniable passion for fitness and absolute love for plant foods (check her out)! I get lots of tips from following Bec. I won't lie! Seeing the abundance of fresh produce she eats, makes me want to run (yes, run!) to the fruit and grocery and grab a tray of mangoes. Bec makes me want to eat more plants - it's easy to see why! So I sat down with my friend and this dynamo blogger, influencer, dietitian, nutritionist and all-round great human being to pick her brain on all things health, and find out how she likes to keep it real. What is your favourite meal of the day? And what do you normally have? Which three foods are always well stocked in your kitchen? Self-care is important for recharging the batteries. What do you do for self-care? What is your favourite ‘go to’ healthy snack? Fresh fruit - it's delicious, convenient, portable, comes in its own packaging and is extremely healthy. What podcast or book are you currently stuck into? I'm currently reading a book called Blue Zones which is about the different groups of people in the world who live over 100, and they are all relatively active & healthy! A peak inside Bec's fridge! Is there a simple hack you use in your kitchen - or in life? (Any tips to make healthy living easier). 1) Shop healthy - write a shopping list and buy only what's on the list. I purposely don't buy foods that I shouldn't be eating all the time, like chocolate or biscuits. If I say no once at the shops to those foods, then I won't have to say no to it a thousand times at home. 2) Have healthy snacks prepared & ready to eat - I have bowls of fresh fruit & Nuts in jars visible on my shelves ready to snack on when I'm hungry. I also cook up snacks like baked veggies and my healthy banana cakes ready to snack on when I'm hungry. I also make sure I take these with me when I'm out and about. What TV show or movie are you watching? Your blog offers some fantastic health and Nutrition tips! What are 2 of your most popular? Your vision to create a healthier Australia and a healthier world is inspiring! What services do you offer to help achieve this goal? Thanks! I offer recipes, health tips, nutrition advice & inspiration on my blog and Instagram @nourish_naturally. I work as a media dietitian with companies, for example, I was Australia's Mango Ambassador. Bec also has an amazing selection of healthy and yummy recipes available on her website. 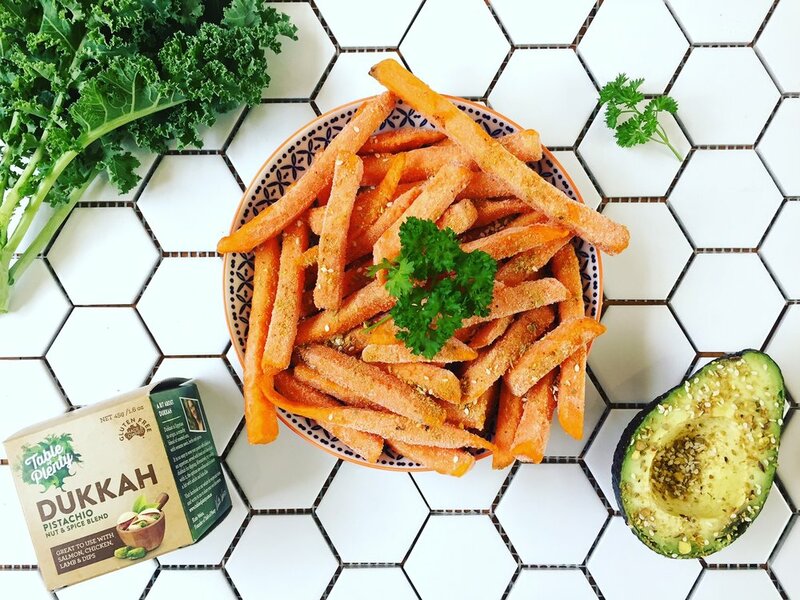 Make sure to check out her super simple recipe for Sweet Potato Fries. LOVED THIS? YOU'LL LOVE THESE BLOGS TOO!